This is my go-to outfit for a business meeting, happy hour or dinner with the girls. It's simple yet stylish and the pink adds a pop of color to the black and white. The detailed embroidery on this Santa Marguerite blouse is so beautiful. I got it about a month ago and have lived in it ever since. 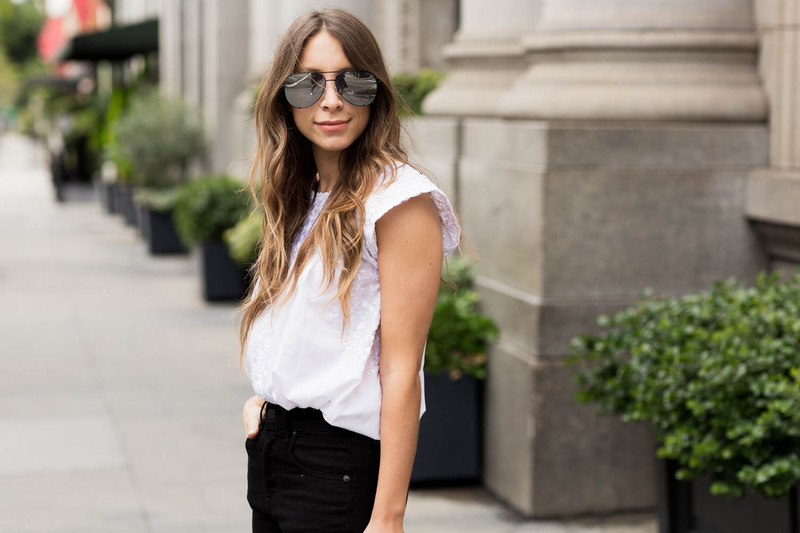 One of the best things about a good white blouse like this one is that it can be worn to a fancy bar in Beverly Hills or styled for a beachy Malibu look (just pair it with light denim shorts, pretty sandals and a straw beach bag). Now on to accessories. I have been wanting a small structured handbag for such a long time but couldn't find the right one. I loved the YSL one but didn't feel like it was special enough to be worth the investment. When I came across this Kendall and Kylie one I knew it would be a perfect addition to my wardrobe. Since it's black and white it goes with everything. It also comes with a strap so that I can wear it as a shoulder bag. For the price you really can't go wrong. Talking about price, am I the only one who finds it impossible to find a pretty, well-made purse in the cheaper range? The options are so far and few between. Michael Kors? No thank you. This Kendall and Kylie line has fashion forward designs in that price range. If you're looking for a cheaper alternative check it out.